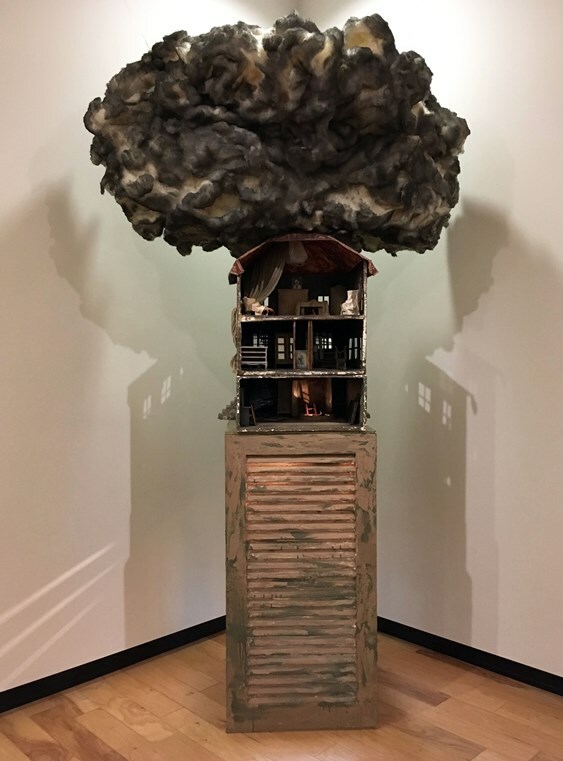 In April of 2018 Barry Krammes installed a 19-piece body of assemblage works at The Green Art Gallery at BIOLA University in La Mirada, California titled, The Morality Theatre Project: A Theatre of Struggle. 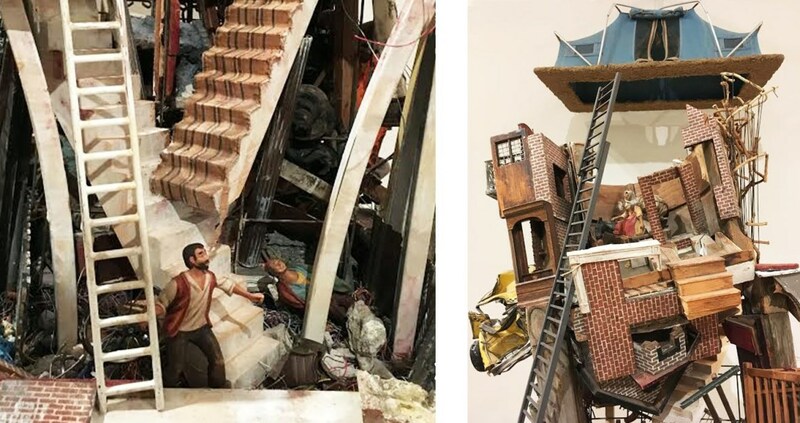 This show represents the culmination of 17 years of creating diorama-like sculptures reminiscent of theatre sets that refer in part to medieval miracle, mystery and morality drama. Steeped in allegory this densely layered world of ambiguity and mystery offers open-ended narratives that address some of life’s most difficult questions. A dedicated educator, unable to work full time in his art practice until his recent retirement, Krammes has nevertheless kept up a steady engagement with his studio research and production. The result is a complex, profound and moving body of work that embodies not only years of labor but also a life of walking by faith in his personal ‘theatre of struggle’, laced, as all life is, with the dramatically tragic and beautiful. This assemblage work is incredibly complex, requiring an extremely intense work process and a great deal of time. Krammes approaches his work as prayer and in prayer. He is dedicated to looking intently to find the best combinations of found objects that he then transforms through multiple stages of metamorphosis. Each player on his stage and each new idea are adjusted and readjusted to fit the visual plot as it develops, until every scene of these complex ‘plays’ are right, and real, and true. This attention to detail has meant that Krammes has not insulted the ‘audience’ by giving easy answers to the struggles he addresses. These are not simple moral lessons or sermons. We are not sliding over slick surfaces of closed definition but instead challenged to contemplate, meditate, listen. Krammes has entered these struggles, these questions for us – felt them, lived them, and found a way to articulate them in his multifarious visual vocabulary, translating them into a rich feast of narrative imagery that we can savor and contemplate at so many levels. Some pieces are raw and we need to take them like medicine that may be initially bitter but then work as mediators, interceding for us and helping us face the truth. This intercessory nature of Krammes’ work that seems to call his audience to prayer and perhaps to repentance, as was the intent of the 15th and 16th-century morality plays the title of the exhibition references, is rare. We are given an invitation to enter the dark corners of our own beings and acknowledge our weakness, and yet in that we are strangely comforted, as in confession. We are seen by the work as we are observing it and the very vulnerability that this artist of deep faith practices allows us to also be more vulnerable and open to the truth. Krammes is an Orthodox Christian and one can perhaps view his works as icons. They are objects that provoke worship. The raw, glued on, rusted, scarred and bent things and the elegant, delicate and tender things become more than THINGS, they become prayers. They are incarnated feelings and concepts and memories and stories and dreams and even nightmares. The physical, carnal or profane nature of the material objects has a strong presence as the objects are loaded with their own history and cultural significances. Placed in their new contexts they are repurposed and transformed into something new, each element made to talk to each other, forced to collaborate as actors on the stage – playing off each other and trying not to upstage or overact their roles. He manages therefore not only to make a wondrous assemblage of ‘things’, but to make the tangible physicality of them somehow disappear behind the visual stories they tell. In this is the magic of theatre and the power of the artist’s creative act. The concrete is transformed into an articulation of longing. And we in the audience gasp or smile or wrinkle our brow or feel moved to tears. In being willing to question and look inside ugly truths Krammes passes from religion to faith – inviting us to join him – walking not just by sight but entering the unknown and possible dangers of considering and struggling with things like temptation and calamity and mystery. The works bear titles such as Of Doubt, Of Insanity, Of Afflictions, Of Departure, Of Longing, Of Lamentations and Of Holy Fools. Although to the religious mind some of these explorations might be construed as doubts and negativity, I believe they are evidence of a fearless walk of trust through the ongoing struggles of life – confronting them with faith, infinite care and courage and with that the ability to reconfigure them. This Theatre of Struggle which Krammes has produced is provocative without being sensational. It is storytelling without an agenda to preach or even teach, though it does both. And it has a silent humility that both the artist and then the audience must submit to in order to really absorb it. In fact humility is at the very heart of Krammes’ process, as a collaborator with those he invites to work with him and with the Spirit of God who he serves diligently, seeing as God does the broken and discarded things of life and redeeming them, repurposing them, celebrating them. Barry Krammes is an American artist who received his B.F.A. in printmaking and drawing from the University of Wisconsin, Eau Claire, and his M.F.A. in two-dimensional studies from the University of Wisconsin, Madison. Krammes has been employed as a professor of visual art at Biola University in La Mirada, CA, since 1983. In addition to his role as a faculty member Krammes has been Chair of the Department of Art, Director of the Biola University Art Gallery, and Program Coordinator for the Center for Christianity, Culture, and the Arts (CCCA). During his tenure at Biola Krammes has developed programming that fuses current art making practices with orthodox Christian values. Over the years he has designed and directed “Arts in Worship” Christmas and Easter chapels as well as many other integrated events for the entire university including the 2011-2012 “Year of the Arts.” Outside the university Krammes has contributed to a number of Christian arts organizations. A founding member of Christians in the Visual Arts, Krammes has organized three national biennial conferences for CIVA and served as editor of CIVA SEEN Journal. He has been the Visual Arts Coordinator for Oxbridge: the C.S. Lewis Summer Institute in England and was the program administrator for Crosshatch, a Southern California arts organization. Betty Spackman, MFA is a Canadian multimedia installation artist and painter with a background in theatre, animation, performance art and video art. She has exhibited internationally and taught studio art at various universities and community arts programs for over 20 years. She has written, illustrated and published art related books and has collaborated, taught and spoken at conferences and galleries in Canada, Europe, the US and Mexico. A Profound Weakness: Christians and Kitsch, Spackman’s 500p illustrated book published in 2005 by Piquant Editions, UK is a personal journal and commentary about images of faith in popular culture. Spackman is also a mentor and community arts educator and has developed The Open Studio Program, an alternative community education model for emerging artists used in Yellowknife, NWT, Medicine Hat, AB, and Langley, BC. Her work has focused on cultural objects and the stories connected to them with a more recent focus on issues of animal/human relations. FOUND WANTING, a Multimedia Installation Regarding Grief and Gratitude (2010-2014) was a 3000 square feet installation project built around a large collection of animal bones and addressed issues of the killing and commodification of animals. She is currently working on the painting installation A CREATURE CHRONICLE about ethical concerns in faith and science regarding transgenics and the development of post-humanism.